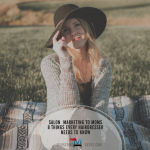 Being empathetic to how mom-life works could give you an edge in attracting clients with salon marketing to moms. 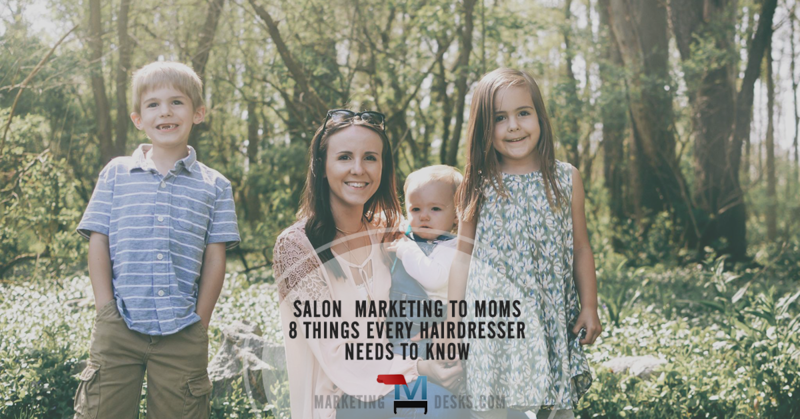 Here are 8 things you need to know about moms to make your salon’s marketing more effective. For this article we went straight to the source. Our field associate Amanda Groendyke is a working mom (a professional photographer) who also happens to have three kids currently aged 7, 6, and 2. She’s got mom-work-life balance down to a science which often means putting her own beauty regimen last. But that doesn’t mean she doesn’t need – and deserve – great hair. 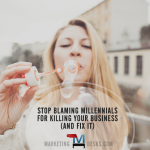 We asked her what hairdressers could do to improve their salon marketing to moms, and this is what she said. Salon Marketing to Moms: I have kids but I still need great hair. 8 things my stylist needs to know. I don’t always have time to wash my hair every day. Or every other day. Use social media to post short tutorials on choosing and using dry shampoo. It may seem like a simple thing to you, but as moms we don’t have time for mistakes! Child care gets expensive. Sooner or later I will probably have to bring one (or all) of my kids to a hair appointment. When children are bored, their “go-to” is to wiggle, fidget, move around and make noise. If I have to bring one or more of my kids to a hair appointment, it would be great if you had an area where they can sit and watch a movie, color, play on their handhelds, etc. ; if it’s gated or closed off in some way that would be a huge bonus. Keep an emergency entertainment kit at your salon with puzzles, coloring books and crayons in case we show up without our own. Offering a discount on children’s haircuts to your clients with kids could benefit you in the client loyalty department. Plus, moms are always happier when we can accomplish two things in one trip. I need quick-and-easy hair style ideas, the stares I get in the school drop-off line are getting old. Hair tutorials, please! Think; braids that don’t look like they came straight off the prairie or flat-iron curls. Moms are always looking for hair styles that don’t look, well, mom-ish. Tell us about pony tails, scarf and hat hacks that can help us fool people into thinking we did our hair instead of hid it. I can multi-task but I can’t be in your chair and picking up my kids from school at the same time. We need those morning appointments! A 1 PM appointment time for a cut and color means we may have to choose between our hair and picking up the kids on time. We all know what will win. And if we’ve timed my appointment perfectly so I can get to the school to pick the kids up, it only works if we are both on time. If the appointment before mine runs over 20-30 minutes, it’s game over. If you want salon marketing to moms to work, make sure you have practical times available in your appointment books for us. Consider opening before 10 one day a week or saving a couple of morning slots each week for your clients with kids. Get us pre-booked into a standing morning time slot for the next 6-12 months so we don’t have to remember to call you every 6 weeks. I want great hair products that will save me time. We don’t have time to wash our every day, but on those days we do a lot of times it is a wash-and-go situation. We need the 411 on the good stuff. Leave-in products that keep hair smooth, etc. A tip; don’t just try to sell us the most expensive products but DO educate us on great products that actually work! Moms do like to talk about things other than their kids and questions besides “doing anything fun this weekend?” are usually welcome. 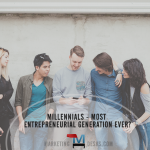 Get to know your clients beyond the small talk, it will improve their experience and make appointments feel more like catching up with a friend. Most importantly, we want to leave the salon feeling like we look amazing. We want all the other moms in the kid pick-up lines to look at us enviously, wondering where we find the time to look this amazing. We want our significant other to remember all the reasons they fell for us in the first place.